Awesome stuff you have here! Haha, thanks, your build was quite amazing as well. Gotta come up with something else now tho haha. You, my friend, deserve a medal for making something as awesome as this. Thank you so much for making those videos, I learned so much with your explanations. Followed along step by step and was able to completely recreate it, as well as make a door using the same basic concept! Wow i could never make one of these(well i could but im too lazy) Great job! AWESOME! Im so glad someone learned something from this! Id love to see video or even pics of what you came up with. We have move stuff planned soon. I have to say I enjoy Tutorials but this dont work for me, first of all, you left out some parts of the build in between tutorials and that is most likely the problem that my elevator stopped while going down to floor 1 (or the battery boxes ran out of fuel because the emergency button wasnt working either). Other than that great job! 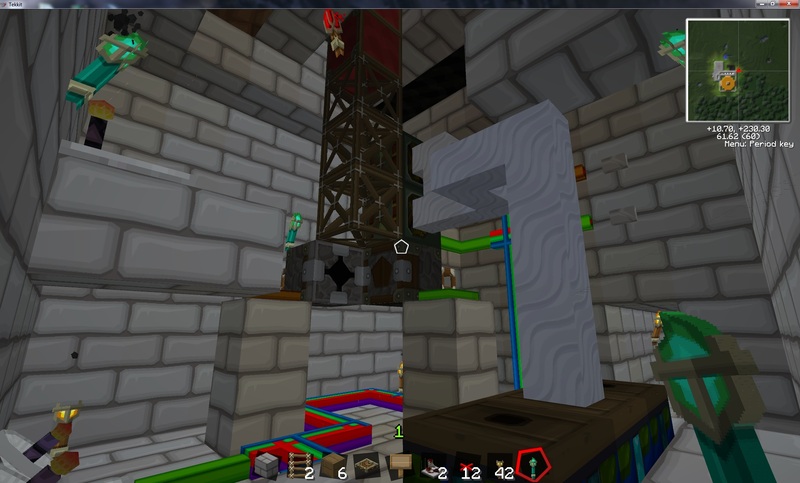 I dare you to make a self building elevator that works like this one by using panels to keep the redstone mounted when most likely pushed by pistons! 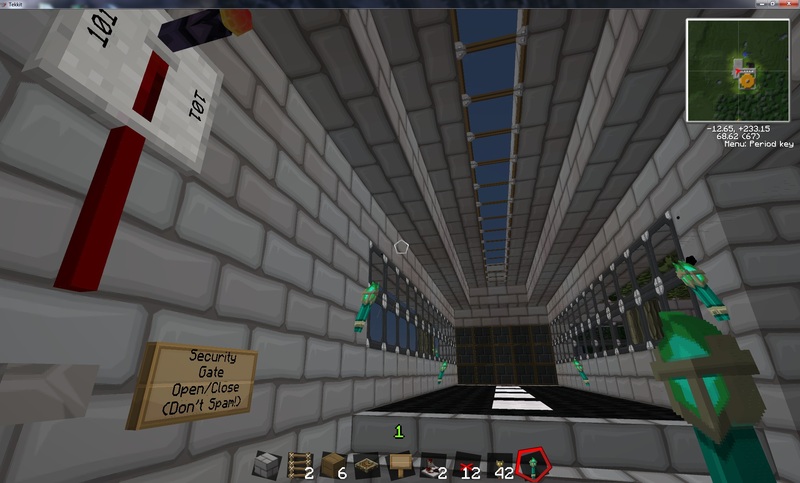 I dare you to make a self building elevator that works like this one by using panels to keep the redstone mounted when most likely pushed by pistons! Here ya go! Put as links as to not lengthen the page. Since there is only two states for the door (up or down) i have a redstone torch attached to the base of the door that when the door is down generates the toggle for the logic room. I could have ran one long bundled cable between the machine room and logic room but i wanted to play with wireless heh. Also I had tried to make it so it would automatically close/open based on if it were night or day but it wasnt working correctly and I scrapped the idea :/ Anyways, thanks again for making the awesome videos! Since there is only two states for the door (up or down) i have a redstone torch attached to the base of the door that when the door is down generates the toggle for the logic room. I could have ran one long bundled cable between the machine room and logic room but i wanted to play with wireless heh. Also I had tried to make it so it would automatically close/open based on if it were night or day but it wasnt working correctly and I scrapped the idea :/ Anyways, thanks again for making the awesome videos! 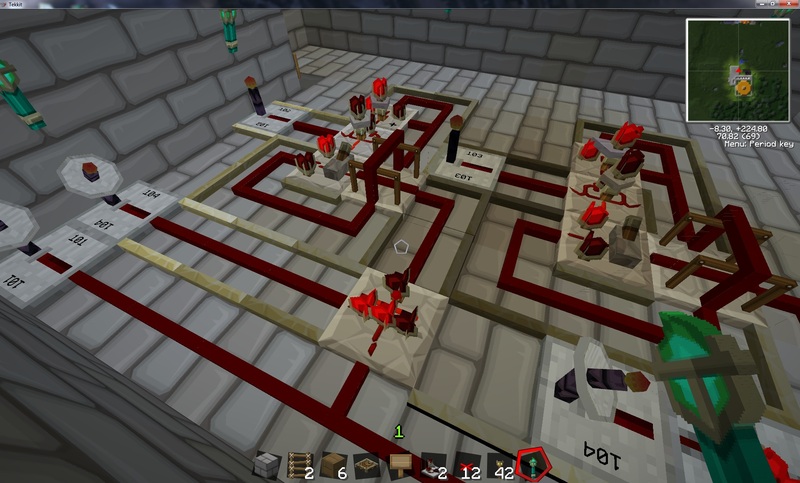 What version of tekkit were you using because when i tried this, the NOR Gate kept getting destroyed. EDIT: I have made my own system just for moving up one floor at a time from inside the elevator but the button i use actually got stuck and sent a constant signal causing me to move up two blocks instead of one. got stuck and sent a constant signal causing me to move up two blocks instead of one. You have to make sure the button is on a rea block, it cant be placed on a frame or a covered frame as the signal wont go thru. No, Im sorry If I misled in the video. I recall I stopped to try and explain that bit but its such a big build its hard to properly explain everything. You might have gotten confused cause I was talking about how you need panels on one side of the button so that it will pull the button with the frames. That said, the button itself has to be on a true block. In the video you should be able to see that there aren't lines around the edges of the blocks that the button is on like the other panels that were placed. Again sorry if I made things confusing. Haha, well I hope my explanations were of some help. Dont worry friend. I try to please so Im making a downloadable versions of this while trying to keep as much quality as I can. We'll see what I can do. This was about the best I could to and keep enough quality there still pretty big tho..